For several years I kept an inventory of my stamps in binders and while it works, it’s pretty cumbersome to pull these huge, heavy binders out every time I want to find a specific type of stamp. When my stamp collection grew to fill two 4 inch binders filled the max, I knew I needed a new way to inventory my stamps if I was ever going to use them again. My solution? To create a stamp inventory that is electronic and can be accessed from my computer as well as my iPhone. I recently found a free program called Evernote which does all of this and more. Evernote makes it easy to remember things big and small from your everyday life using your computer, phone, tablet and the web. Here is Evernote’s YouTube channel where you will find several videos. To download Evernote for your computer, click here. I knew that it was going to take a long time to get all of these stamps switched over to a digital version so to keep from getting overwhelmed, I told myself that I would only spend 15-30 minutes each night transferring them over to the new system. Then I ended up getting sick and while I was stuck in bed, I actually finished it quicker than I thought. Open Evernote, Choose “File”, “New Notebook” and then name your notebook whatever you’d like. I named mine “Stamp Inventory Notebook”. If you wanted, you could separate your stamps by category or by manufacturer, but I find it easier for me to keep them all in one notebook. Click on “New Note”, where it says “Click to set title”, click there and enter the title of your stamp set. I always put the manufacturer in front of the name if I know it. For example: “Paper Smooches – A Little Lovin’” is the title of one of my stamp sets. I put both tags for the images and the sentiments so that when I’m searching for something, it will be easier to find it. That’s it! Your first note is complete. Now, just start all over and click on “New Note” again. Easy right? Time consuming, yes but in the end I you will have a searchable database of all of your stamps which will make you more likely to use them more! 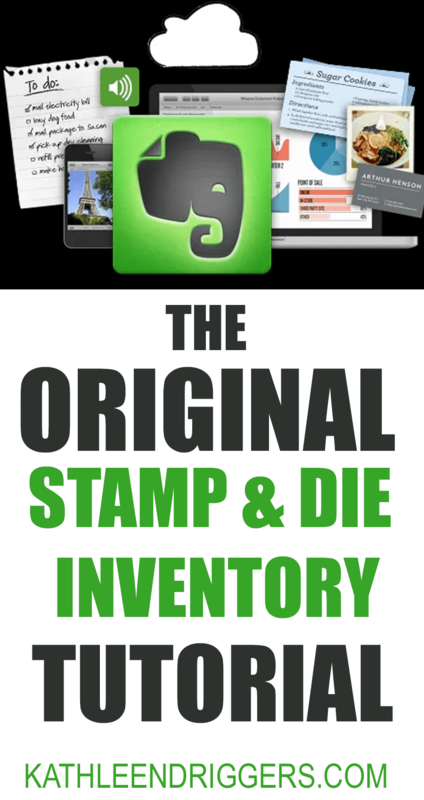 Here is a copy of my finished (but always ongoing) digital stamp inventory using Evernote: Kat’s Evernote Stamp Inventory. If you have any questions about this project, please feel free to contact me via email or buy leaving a comment. Thank you, thank you, and thank you for explaining how to work this Evernote program. I’ve been so LOST and you just make it sound so easy peasey, lemon squeezy! OMG! You’re going to change my life!!! Thank you, thank you! I can follow your step by step tute by listening and visually on screen. It’ll take some time…but I’m determined to organize my craft stuff. I had always planned to establish a manual inventory of my extensive stamp collection, but have put off because it would be such a huge undertaking. This electronic version will be so much easier! Thank you so much for such an informative video tutorial. This will suit my needs perfectly and make sure i shop my stash much more effectively. You’re a gem! Thank you so much for this! I just got into stamping/crafting and this will help me keep my stuff so organized! I’ve started to make my notebooks that way I don’t buy something I already own. Thank you for the information…I just set up my account and already started filling in my notebooks. Thanks so much for all the information. I’ve already started with Evernote. Now just need a system for storing that I can live with. Great video…thanks! Curious how you handle sets with no online pictures….by entering tags only? I have a lot of sets that won’t be online, older etc. Thx! This is tremendous! A lot of work when you have a lot of stuff but so worth it, especially the search feature! Thanks so much for the video tutorial! You are the best!! You are right, it can be a lot of work but SO WORTH IT in the end!!! You are very welcome and thanks for the kind words! Great idea! Thank you , I have a new window’s 10 computer and Evernote is just sitting here waiting for me. Now I will use it. For my stamps and dies! Thank you for the tutorial!!!!! I have started using evernote now for my inventory lists now, thanks to you… Thank you! thank you! thank you!!!!! Kat, I love this inventory idea. only problem I did all my dies, all my stamps, embossing folders etc. Works wonderful. Problem – don’t laugh. I have maintained all the same inventories in notebooks (lotsa notebooks) with every jot and tittle recorded via computer – if there is a comma stamp – It is recorded with an entry. I really hate to throw them away – there is so much work in them…. I am kidding about the problem – what I had done before “the change” was add all the files to a notebook on evernote. I can say – since I have everything done in evernote (your way), I have let the old way slide. Hope you are smiling at this note. What a great idea 🙂 I haven’t started the Evernote process yet– but was wondering if there is a way to print out the pages of the inventory you create to have a hard copy binder. I’ve been number all my stamps and making a book sorted by theme and am trying to think of a way to keep that portion of my system. Again thanks for sharing this great idea. I’ve recently started using Evernote to scan in all the useful inspiration or tutorial sections of my old magazines as I realised I looked through them when they arrived and again when the magazine holder was full but at no point in between. So instead of keeping a whole box full of each magazine taking up a whole shelf I will now have one box for the most recent editions and the best of the rest will all be digital. Hi great idea! !I too have 4 binders chock full of a Stamp Inventory so I decided to use this. One question, can you go back and put the tags in if you forgot or should you just delete the entire thing and start over?? thx for the how to , I am so going to try this , I seem to lose everything lol this will so help me get organized better !!! Thank you so much for outlining each step — and the video is a great help too! I have had the Evernote app downloaded for months but, being technically challenged, didn’t have a clue on how to start. Did you have to upgrade evernote or did you just use the app as is? I seen someone upgraded for $35.00 Cdn because evernote didn’t have everything she needed to do her stamp collection. First of all, hope this finds you and your family doing well! I’ve been following you for a few years now and have always wanted to implement EverNote for all my crafting supplies but like you, I too suffer from an extreme case of Fibromyalgia, CFS, Reflex Sympathetic Dystrophy/Chronic Regional Pain Syndrome and more but I’ll spare you the details, lol, so needless to say, pain is never below an “8” 24/7! I have 3 rooms of craft supplies and 3 years ago I decided it just didn’t “flow” right and needed a better organizing system. After many years of seeing and watching and researching, I decided to follow Total Tiffany using her 4 section system using the ScrapRack, it didn’t take a rocket scientist to figure out there was no way 3 rooms FULL of crafting supplies would fit into even 5 ScrapRacks, lol. I’m going to be using the “wide Sterilite drawers” and label each drawer just like Tiffany does within the ScrapRack, with the exception of ink pads, sprays, pens, markers, glitter glues, etc. Needless to say, those rooms are in TOTAL DISARRAY right now and has been for almost 3yrs. BUT…I have never forgotten you using EverNote and in some of Tiffany’s older videos, she suggests using it as well. I’m determined to get those rooms done if it kills me! So in saying all of this, I just want to say THANK YOU, THANK YOU, THANK YOU for being so generous with your time and not only sharing a step by step post on your blog, but also for this awesome video!!! I’m determined to get these supplies organized so I can finally enjoy crafting again! Also, would like to Thank “SusanPenterPearson” for her above comment about her magazines being added to EverNote as well, I have collection after collection of craft magazines from when they use to be in print and couldn’t figure out what I was going to do with them, now I know! Thank you Susan! Awesome idea!! Thanks so much for doing this video – I have heard of Evernote, but hadn’t used it yet. I have so many stamps, and although this will take me a while, it sure will be nice having this system when I am done! Thank you. That was a great explanation of using Evernote for crafting. I have been using it for a little while now and absolutely love it but when I first started it was difficult to find info on how to manage crafting products. I wish I had found this the. Well done and congrats on sharing your knowledge. Cheers and happy crafting. Looking to definitely try and set up this system. I do have a couple of questions though. Do you find pics of the dies in Google images? Also do you store your stamps by company. That is the way that I have stored mine for a long time. I think that at this point it would be easier to store by numbers for when you add more which I am quite sure that I will do. Thanks for helping me by answering this question. I posted back in August that I was going to start doing this. Well here it is October and I have finally gotten started. I have cataloged 200 stamps, done all of the various ink from different companies, in separate notebooks and now I will be doing my stecils in another notebook. I love this system but I do have one question regarding backing up. If i use a flash drive how do I go about doing it. If I want to add more stuff to notebooks and I use the same flash drive will it just add in the new items onto the flash drive or what? I hope that y ou can understand this question. I am not sure that i made it very clear. Thank you for sharing this. It will be a life saver for me. This is a fantastic idea and a great video. I use One Note instead of Ever Note — the concepts are the same. It goes quicker than you would think; I actually got 8 stamp sets entered in about 15 minutes. I copied my See Matching Dies from one note to the next which saved typing and font time. In the long wrong this is going to save me so much time. Thank you! I know you put in a lot of time and work creating your inventory notebooks, but is the a way to share what you have created so we poor souls with a bazillion stamps can get a bit of a jump start. We could delete the ones in the notebooks we don’t have, but it would really be great to have a starting point. I’m so glad you made this tutorial! I was so overwhelmed on my own. I didn’t know you could tag each stamp set so you could find what you’re looking for later. I can’t wait to get this finished! Thanks so much!! Just curious what u wouldn’t keep ur dies with ur stamp set?